Fun and Creative ideas for Teaching English: What’s the optimum amount of homework to set a teenager? Coaxing teenagers to sit down and do their homework is never an easy task. But is it actually worth their while to slave away for hours on end every evening? 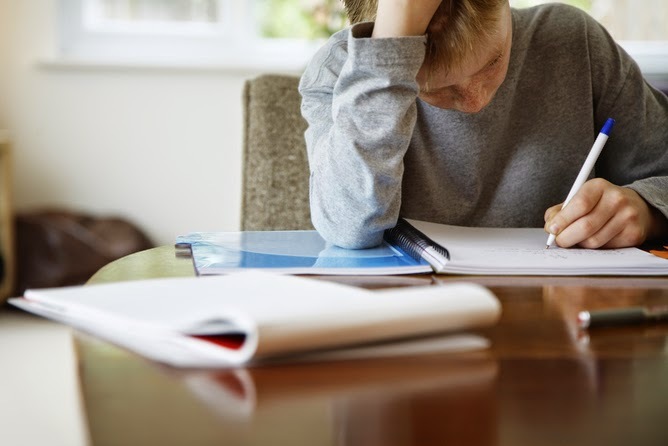 Not according to a new study of Spanish secondary school students which has concluded that the optimum amount of homework for children is around one hour a day. Researchers at the University of Oviedo studied the maths and science homework and test results of 7,451 adolescents with an average age of around 13. They found a relationship between the amount of homework completed and children’s attainment. But the authors acknowledge they can’t say definitively that one hour of homework a night in total actually causes better test results. Previous research in this area is both inconsistent and inconclusive. Some has shown the positive effects of homework and some its negative effects. In 2012, The Guardian reported on Department of Education research showing that two to three hours per day produced greater effects on achieving the highest results. In 2014, research at Stanford University found that too much homework can have a negative impact on children. Homework can help to establish a routine and to develop independent learning skills that will be useful for professional life. Conversely, it could be argued that working at home in the evenings is the beginning of an unhealthy work-life balance and that there are academic drawbacks in studying instead of sleeping. It’s unclear whether the children in the Spanish study achieve more as a result of doing the “optimum” amount of homework. Children of different abilities may take different amounts of time to complete their homework. If we subscribe to the idea that there is an “optimum” time, then we are effectively saying that children who work more quickly should complete more homework than children who work more slowly, which is arguably a disincentive for the fastest – and probably the most able – children. The study also acknowledges that the nature of the homework has more influence over the outcomes than the time taken to complete it. This is an important point and is underpinned by a common sense view that an hour of inappropriate homework will be less effective than 45 minutes of appropriate homework. It is only through understanding what the goals of homework are that we can properly consider how much should be set. There has been much disagreement about this among researchers: some argue that homework is about consolidating new knowledge and improving test scores, while others argue that homework is about developing skills. The reality is that teachers set homework with different purposes, so any optimal amount of homework is unlikely to apply to all situations. In the context of mathematics, homework is often about practising a particular process – such as solving equations – whereas in other subject areas there may be a more conceptual focus, such as research into a particular aspect of history. Even if we accept that there is an optimum amount of homework, there are numerous other factors that need to be considered, including the subject area, the length of the school day, the socio-economic background of the student and the age, gender and culture of the student. With so many factors to consider, it is challenging to ensure both equity and excellence – and it is most likely impossible to generalise about an optimum amount of homework. For example, parents from middle-class families are more likely to be able to support their children with homework or to hire a tutor. This means those children from disadvantaged backgrounds become further disadvantaged as they are likely to have less academic support at home. The cultural variations between children are also significant, not only from the family perspective, but from the expectations of society. For example, children in China and the UK have very different expectations and experiences in terms of the volume of homework set. It has also long been argued that girls outperform boys in coursework, which is not dissimilar to homework. So it is difficult to generalise that all 13-year-olds should be set no more than one hour of homework a day. Every child has a unique set of individual needs that may vary over time. There has been much discussion in recent years about personalised learning in the classroom, but less so about the benefits of personalised learning through homework. One hour a day may well be the optimum amount of homework for some children in some circumstances, but let us not forget that every child has different needs.